The GOP of 2017 is the most extreme party coalition since the Civil War. The GOP of 2017 is more radical than conservative, and the outlook is bleak. 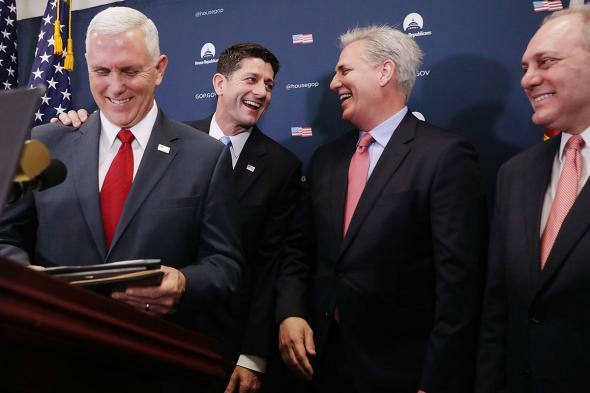 From left, Mike Pence, House Speaker Paul Ryan, Majority Leader Kevin McCarthy, and Majority Whip Steve Scalise during a news conference on Wednesday in Washington. The Republican Party in 2017 isn’t an ordinary political party. It is an ideological outlier, the most extreme party coalition since the Civil War. Trump voters may expect a more conservative spin on the status quo, but what they’ll get is a radical shift to the right, with fundamental changes to vital programs such as Medicare and Medicaid. Trump voters who earnestly hoped for relief are in for a shock. What they’ll receive instead is an assault on their fraying social safety net. Of everything that contributed to Donald Trump’s victory last November, one major factor was his distance from conservative ideology. Throughout the campaign, Trump was more likely to defend programs such as Social Security and Medicare than voice conservative shibboleths on taxes and “small government.” He told his supporters he would repeal Obamacare, but he would be sure to take care of them, promising government programs for them, the deserving. Look to the states and you can see what this conservatism looks like in action. The same Tea Party that handed the House of Representatives to Republicans in 2010 also elevated Sam Brownback to the Kansas governor’s mansion and gave him GOP majorities to work with. In short order, they slashed income taxes for the wealthy, repealed taxes for tens of thousands of businesses, privatized Medicaid delivery, and slashed hundreds of millions of dollars from the state education budget. The results speak for themselves. Tax cuts starved the state for revenue, earning it massive deficits with little additional job growth. Those deficits sparked a fiscal crisis, forcing painful cuts to higher education and other essential services. Despite the ruinous results in our laboratories of democracy, Republicans want to bring these policies to the nation at large. GOP leaders are planning strategies for how to repeal the Affordable Care Act, slash upper-income and corporate tax rates, and end the tax on wealthy estates. They seek a full rollback of Obama-era regulations on climate and employment and want to turn Medicaid into a series of “block grants” that would cut the program beyond recognition in states with hostile legislatures. They want to cut food stamps and other forms of income assistance, while adding tough new requirements for eligibility. They want to free banks to resume predatory lending and—assuming they find the support—want to turn Medicare into a series of vouchers, while also reducing the amount of money that goes into the program.